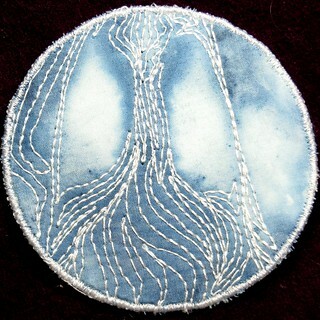 White thread on indigo makes me think of sashiko (not sashimi!) the Japanese mending and reinforcing stitch that has become an artform all its own. It is done by hand rather than machine, although I saw a dedicated machine last week that only emulates it. I'm waiting on more indigo so I can rebalance the vat and get darker colors. In the meantime, I'm putting some different resists to see what among the easily available things in the house works.